No matter how skilled you are at DIY projects around the house, some jobs are best left to the professionals. Garage door repair should probably be one of them. Aside from routinely lubricating a noisy garage door ourselves, hubby and I learned firsthand from a home building contractor friend of ours that it’s best to leave most garage door repair issues to the experts. Yes, there are many projects around your house and yard that can benefit from your DIY talents — and you’ll get a sense of accomplishment while saving money as well. But if you’re in need of a garage door repair, you should consider the following points before trying to fix it yourself. If you’re the DIY-type, then you’re probably willing (and eager) to try just about any garage door repair. But please, think twice before you do! Here are the 10 biggest reasons your garage door isn’t working properly. Something is in the door’s path. Door settings aren’t set properly. But anything bigger than that — like any garage door repair project that involves the springs or the tracks — should be done by a professional! Read this before you DIY! If your garage door is still not working properly (or you’ve got a bigger issue), then it’s time to call a garage door repair professional. Understands exactly what needs to be done. Knows how to do it right the first time. Has the best tools available to complete the task. By hiring a garage door expert, you won’t need to worry about the garage door suddenly breaking down or doing something that will lead to other, bigger issues. #1 – Garage doors are heavy. Security should always be a concern for all exterior doors — and this includes the garage door. In order to ensure security at home, garage doors are usually quite heavy. Often, they weigh more than 100 pounds! Keep in mind, it’s also difficult to find equipment around the house that’s strong enough to support the garage door. Most items that you have around the house will simply not be able handle all that weight. Handling the weight alone of your garage door could cause serious injury. Not to mention the fact that a support failure during your DIY garage door repair could lead to an unspeakable catastrophe. How heavy is your garage door? Here are some average weights of garage doors. #2 – It’s probably not the best use of your time. Let’s be honest here, most of us don’t have time to diagnose what’s wrong and properly fix a garage door. They spend hours figuring out what the problem is. The repair itself takes a long time — unless you have a lot of help. They don’t have the right tools in their toolbox. 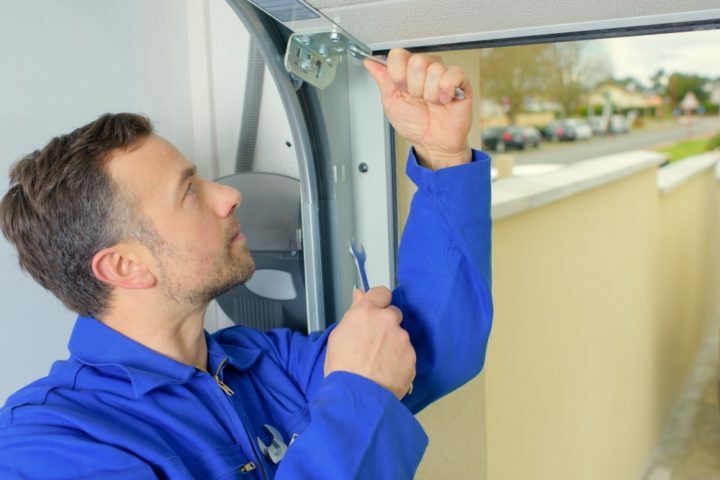 So, unless you have a lot of time on your hands, the most fastest and most efficient way to get your garage door repaired is to hire a professional. Here are some things you should look for in a professional garage door repair person. #3 – You might not have the right tools. Most garage doors are built to be as strong as they are heavy. This means that powerful tools are required for cutting, drilling, and so on. The average tools most of us have around the house aren’t necessarily the ones needed for serious garage door repair. For example, using tools with insufficient power pose a risk of skating, jumping, or otherwise losing control. Professionals have all the right tools, experience, and knowledge to repair any garage door safely and ensure that everything is working properly before they leave. Industrial tools that are strong enough to deal with the task can be lethal in the wrong hands, and experience with ordinary household power tools alone isn’t enough to ensure your safety. Here is a helpful list of the tools necessary to repair most garage doors and their cost. #4 – Working with high tension is dangerous. The springs which control the raising and lowering of garage doors need to be powerful enough to lift the heavy weight of the garage door. They must also be kept under high tension. Over time, they will naturally tend to slacken off and need to be tightened up. This is not a job for the inexperienced amateur. It’s essential to get just the right tension into the springs! If the tension is too low, they’ll be ineffective. If the tension is too high, you run the risk of rupturing them. Rupturing can cause potentially deadly results from flying shrapnel. If you don’t have the correct tools to tighten the springs and to check the tension accurately, you should hire a professional garage door repair person. Here’s how to measure extension springs for a garage door. #5 – You could even cause structural damage. If your tools and experience aren’t up to the job, you run the risk of damaging your garage door and the areas surrounding the garage — even if you escape injury. The damage isn’t always visible at first. If your garage door panels aren’t properly balanced and fitted, they can cause undetected tensions in the surrounding frame. This carries a serious structural risk for your garage as a whole — which may not become apparent until the problem is too serious to be easily fixed. Here’s how to recognize if your garage door is unbalanced. #6 – Hiring a professional will save you money in the long run. Hiring a professional saves you money. Wait… what? While it may not seem like it at first, the cost of repairing the garage door on your own can be quite high. You might invest in unnecessary tools & materials, or you may cause additional problems from the work you’ve attempted to do yourself. Understand what needs to be fixed. Repair the problem correctly the first time. By hiring a professional, you can get your garage door repaired efficiently, safely, correctly — the first time. You won’t need to worry about any added costs to fix a repair that’s gone wrong. See how to avoid being scammed by a professional garage door repair person. It’s a great idea to learn valuable DIY home repair skills — so that you can solve common problems in a pinch. But when it comes to garage doors, I truly believe (and hubby has learned firsthand) that most garage door repair projects are usually best left to the experts!